The official launching ceremony of the exhibition trade fair took place on Monday 18 February 2019 by Cameroon’s Prime Minister H.E. Joseph Dion Ngute, who expressed government’s appreciation to all participating companies to the trade fair. H.E Luc Magloire Mbarga Atangana Minister of trade encouraged the exhibitors especially foreign companies, thanking them for choosing to do business with Cameroon. He further stated that if agricultural methods were modernised, it could improve on the business atmosphere in Cameroon, given that agriculture remains the backbone of the economy. The UN Resident coordinator, Allegra Baiocchi, said that Cameroon needs to build a conducive environment for business to grow, and called on Cameroonian companies to ensure they are doing business responsibly, in line with the ten Principles of the UN Global Compact. On Wednesday 13 February 2019 and prior to the kick-off of the trade fair, UNIC’s NIO; Jean Njita and Ms. Audrey Moneyang; Youth policy Assistant (UNDP) were special guests on “MIDI LIFE”, a One-hour midday programme on national television “Cameroon Radio and Television” (CRTV), to situate the raison d’etre of UN’s presence at Promote (engage youths to the “youth Connekt” initiative and engage the private sector to take advantage of the opportunities offered by the SDGs and also finance the SDGs), as well as inviting the general public to visit the UN stand. “Youth innovation and business opportunities: the youth connekt approach” presented the different opportunities available or youths in economic, social and profession domains. “Financial inclusion to reduce inequalities and accelerate emergence in Cameroon” highlighted the fact that financial inclusion was a critical enabler to meeting the SDGs and leave no one behind, especially actors of micro finance sector. “The private sector: key to realising the SDGs in Cameroon” gave an insight on the indispensable role to be played by the private sector towards achieving the SDGs in Cameroon and the world. UNIC prepared and animated a weeklong “ONE UN Stand” with documents, videos, and other information material from the UN family; UNECA, UNFPA, UNIC, UNWOMEN, UNESCO, UNICEF, UNV, UNDP, etc.. Displayed were documents education, gender equality and violence against women, Volunteering, contraception, condoms and HIV/AIDS, financial inclusion, basic facts on the UN, SDGs factsheets, Africa Renewals, and other books by UNIC. The SDG mystery wheel was present at the stand. Visitors unceasingly spinned the wheel and answered questions on the respective goals. Some SDGs gadgets such as mugs, pens, t-shirts, books were awarded as Prizes for good presentations and answers. Visitors greatly appreciated the game as it gave a broader knowledge on the SDGs. Many took pictures with the SDG ring as well. Cameroon’s Prime Minister and Head of Government; H.E. Joseph Dion Ngute visited the UN stand on Wednesday 20 February, during which he and his suit were handed gifts consisting of UN documents and magazines. Mrs. Allegra Baiocchi; UN Resident Coordinator was on hand in a live webcast interactive session with visitors on Friday 22nd February, to provide answers to the numerous questions of visitors present at the stand on the UN and its activities. This entry was posted in Cameroon, Economic Development, Sustainable Development Goals on April 11, 2019 by Jean Njita. Last New Year, I issued a red alert, and the dangers I mentioned still persist. These are anxious times for many, and our world is undergoing a stress test. Climate change is running faster than we are. Geo-political divisions are deepening, making conflicts more difficult to resolve. And record numbers of people are moving in search of safety and protection. Inequality is growing. And people are questioning a world in which a handful of people hold the same wealth as half of humanity. Intolerance is on the rise. Trust is on the decline. But there are also reasons for hope. The talks on Yemen have created a chance for peace. The agreement signed in Riyadh in September between Ethiopia and Eritrea has eased long-running tensions and brought improved prospects to an entire region. Now we need to increase ambition to beat this existential threat. It’s time to seize our last best chance. It’s time to stop uncontrolled and spiraling climate change. In recent weeks, the United Nations also oversaw landmark global agreements on migration and refugees, that will help to save lives and overcome damaging myths. And everywhere, people are mobilizing behind the Sustainable Development Goals – our global blueprint for peace, justice and prosperity on a healthy planet. When international cooperation works, the world wins. In 2019, the United Nations will continue to bring people together to build bridges and create space for solutions. We will keep up the pressure. And we will never give up. As we begin this New Year, let’s resolve to confront threats, defend human dignity and build a better future — together. I wish you and your families a peaceful and healthy New Year. This entry was posted in UN Secretary-General messages on April 11, 2019 by Jean Njita. Yaoundé, 20 February – Humanitarian needs in Cameroon have risen by a third this year owing to an upsurge in insecurity and violence, leaving one in six people – mostly women and children – requiring assistance. Today we launch the 2019 Humanitarian Response Plan appealing for US$299 million to provide support to 2.3 million people. “The humanitarian emergency in Cameroon must remain high on our agenda. We must step up efforts to meet the needs of the affected population, many of whom are surviving in deplorable conditions without assistance,” said Ms. Allegra Baiocchi. the United Nations Resident Coordinator and Humanitarian Coordinator for Cameroon. “In recent years, funding for humanitarian response has not kept pace with the needs. This means that we have been unable to provide enough food, water or medicine to vulnerable people, treat malnutrition or assist displaced families. This is very worrying as humanitarian needs are likely to continue growing in the coming months,” Ms. Baiocchi said. In 2018, only 40 per cent of the $320 million needed for humanitarian assistance was received. This year, around 4.3 million people need urgent assistance. Displacement has risen by 82 per cent compared with 2018. Renewed armed attacks have driven tens of thousands more Nigerians into Cameroon’s Far-North region, which already hosts 138,000 refugees. In North-West and South-West regions, worsening violence has uprooted 437,000 people and forced over 32,000 to seek refuge in neighbouring Nigeria. The East, Adamaoua and North regions host 275,000 Central African refugees. The crises arising from armed violence add to existing chronic vulnerabilities, including inadequate basic services, epidemics, food insecurity and malnutrition as well as the impact of climate change. The 2019 humanitarian response plan focuses on providing immediate assistance to save lives, bolstering the protection of affected civilians, identifying risks and vulnerabilities to support the resilience of communities to shocks. This entry was posted in Cameroon, Humanitarian Aid on February 20, 2019 by Jean Njita. 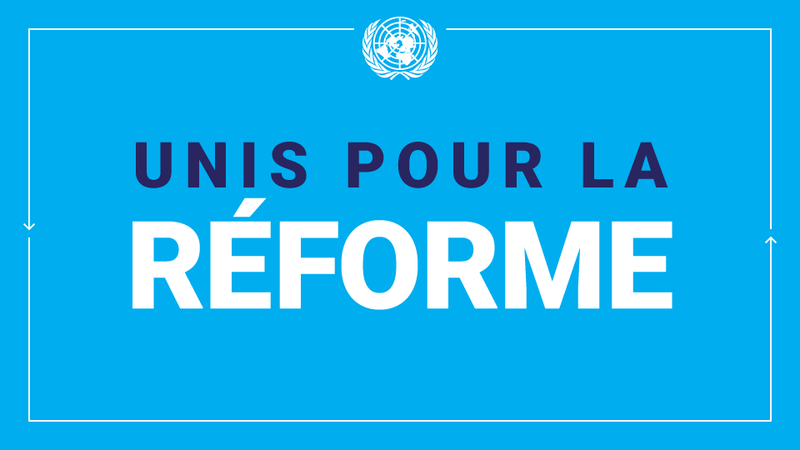 This entry was posted in UN Reform on February 18, 2019 by Jean Njita. “In answer ro questions about the situation in Cameroon, the UN is concerned about reports of violence and use of force by security forces during demonstrations in Douala in recent days. We condemn incidents of violence at Cameroonian embassies in Paris and Berlin. This entry was posted in Breaking news, Cameroon, UN Secretary-General messages on January 29, 2019 by Jean Njita.